President Muhammadu Buhari has arrived London for a 10-day working holiday. 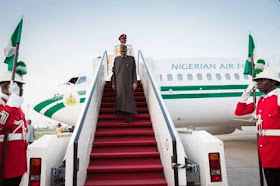 The President left Abuja for London in the early hours of Friday. On hand to bid him farewell were the Inspector General of Police, Ibrahim Idris, Minister of the FCT, Mohammed Bello and the Chief of Staff, Abba Kyari. He said they want to cause trouble and remove Saraki unconstitutionally, while Buhari will claim he has no hand in it as he was not in Nigeria when it happened.